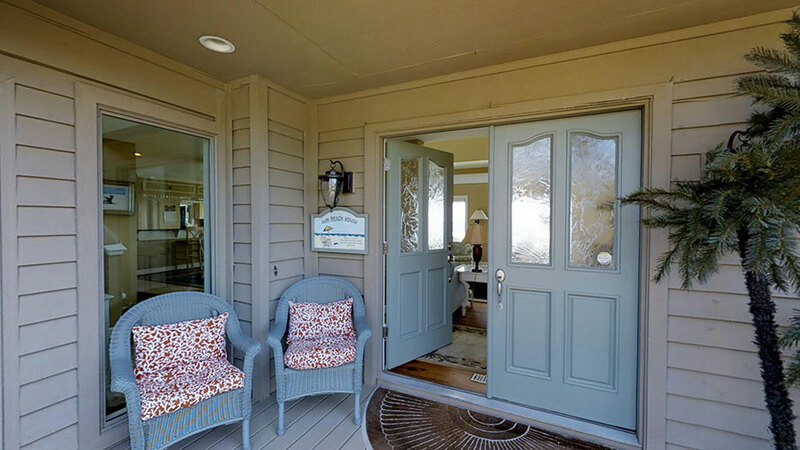 *Normally configured with 6-Bedrooms, Sandpiper's Nook is available as a 4-Bedroom home during certain times of the year and priced accordingly. The extensive addition and remodel of this home in 2009 and 2010 has turned this home into a vacation paradise. The huge private pool and spa now front the ‘SeaScape’ outdoor living room, complete with outdoor bar and refrigerator, charcoal grill, couches, fans, lights and mirrors that reflect the ocean for a breathtaking gathering place. Wake up to the sunrise over the water, watch the dolphins go by from the elevated deck, use your private access to the beach at your feet – life is good. Dine on the deck with the almost transparent fence and feel the weight of the world slip away. 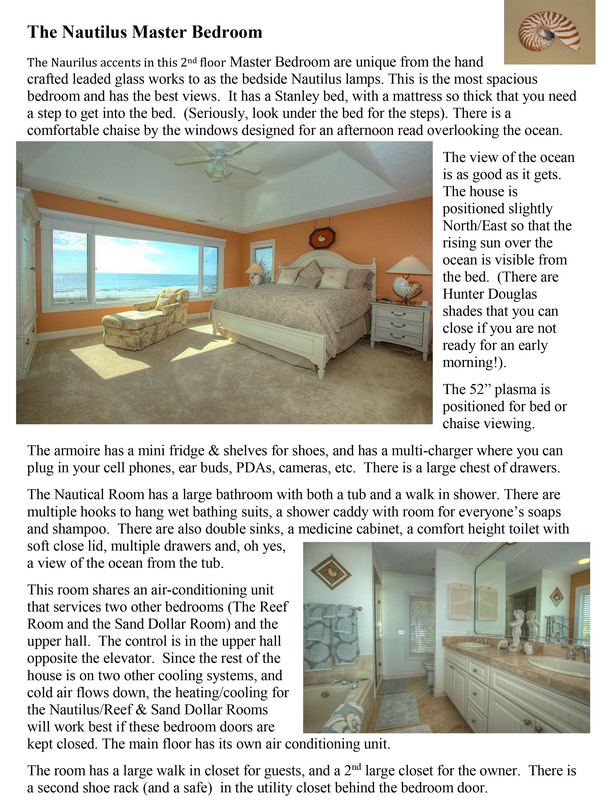 Sandpiper's Nook is a gorgeous home that is 22 feet above sea level with spectacular views from every room. 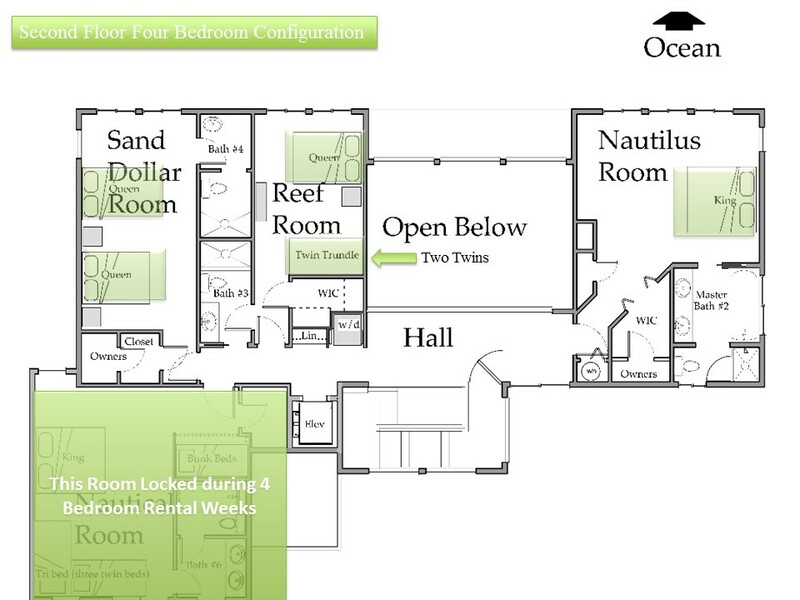 Each of the 4 bedrooms has been freshly decorated to an individual theme, and whether you choose the Nautilus, Sea Shell, Reef or Sand Dollar Room, you will enjoy premium beds and amenities. Your every convenience has been thought of, from wine frig to ice maker to DVR, DVDs, large plasma TVs, high speed wireless & high end cable, electronic charging stations, state-of-art appliances, video library, restaurant guide, places to read & relax in every room…. This is what the ideal vacation should be. Come join us, your champagne is on ice. 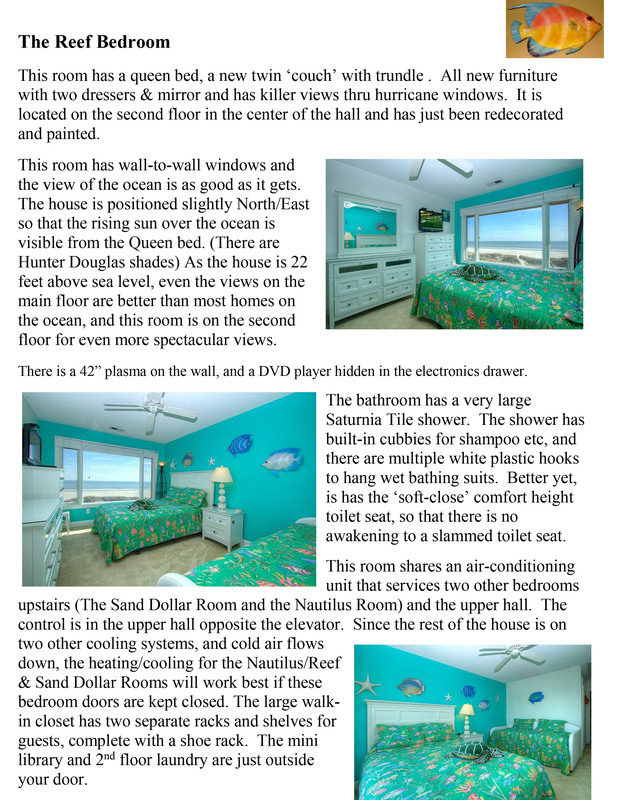 Read The Story Behind "Sandpiper's Nook" as shared by the owner of the home. Excellent house!!!!! Excellent service!!!!! I would highly recommend Destination Vacation for the quality of our accommodations, but even more for the excellent service! We’ve booked through many property managers over the years and Destination Vacations was one of the best. From booking until our visit, DV was top notch and just pleasant to deal with. We’ve also stayed in several nice oceanfront homes, but 33 Sandpiper was by FAR the best. The property is well maintained and looks as nice as it does in the pictures. We’ve been disappointed before when we realized the pictures of the property we rented did not truly represent the condition of the property. The owner has gone out of her way to make staying in her home a wonderful experience. This is a little thing, but ALL light switches are labeled, so you don’t get frustrated trying to find the switch that works the light you want to turn on. She also provides most of the staples you’ll need so no buying a bunch of stuff you’ve got to take back home. The home is in a wonderful location, up from Coligny Circle. We’ve stayed in Palmetto Dunes a lot and always thought it was convenient, but we’ve stayed several years now Oceanfront North of Coligny and just love the area. The pool is enormous and accommodated the 8 people in our party with ease. Nice bottom that doesn’t tear your feet up and everyone enjoyed the spa at one end of the pool. Oh, and the 3 huge hurricane windows across the entire oceanfront side of the house made you feel like you were outside. And you could lower the perforated sun shades and still see out. Way better than those darn vertical slats that are always missing a few slats. And we really enjoyed the deck across the entire ocean side of the home. A really cool design idea was stepping down the very front edge of the deck so the cable railing (used everywhere) was below your line of sight. You can sit in one of the 8 or 10 rockers and look straight out to the beach and ocean. Lastly, the home has the best parking/driveway we’ve ever had at HHI. Plenty large to accommodate several cars OFF the road. We had two cars and parked underneath the house, so our cars were always out of the sun when we left to go out. All in all, The BEST home we’ve ever stayed in at HHI. 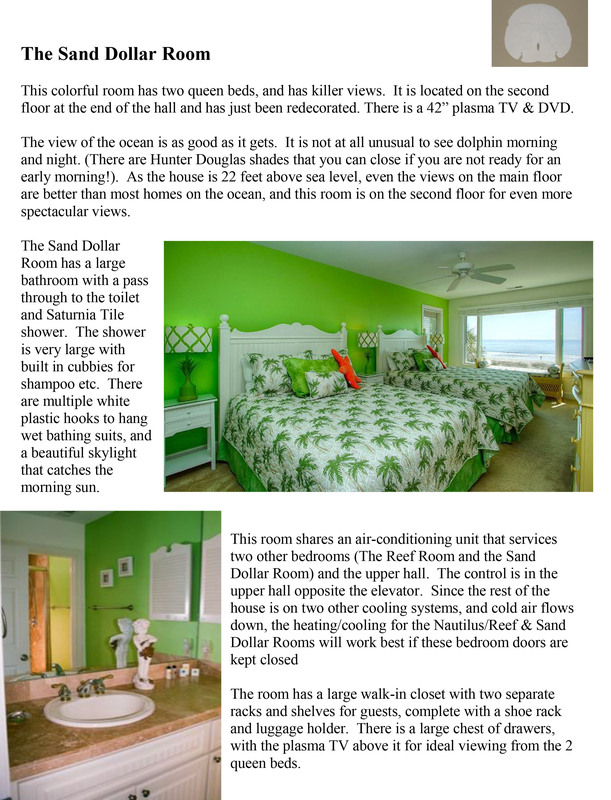 If you can swing a stay at 33 Sandpiper, you won’t be disappointed! Gail was great and very helpful through the process. the house was great and the proximity by bike to restaurants, etc was great. Thank you. Outstanding home!! Most beautiful porch & view!! Lovely, comfortable house. Exceptional views. No detail overlooked. Sincere and effective effort to make the guests comfortable. Terrific experience and a wonderful location. Only item which might improve the stay would be to improve the dishwasher. I live in Australia and have been vacationing on Hilton Head for the past 4 years. We spotted 33 Sandpiper during our first year, when we were staying nearby on Dune Lane, and have been returning to 33 Sandpiper every year since. We have already booked for next year! I travel to HHI from Perth with my wife and son, and we meet up at Sandpiper with my two daughters, two sons-in-law, and 4 grandchildren. We all love the house and feel very, very comfortable there, which makes for a tremendously relaxing family holiday. The house itself is beautiful -- very large and very well appointed. There is plenty of space to accommodate everyone together, but also plenty of space to be on your own when the mood strikes you. The owner has put a great deal of thought into the property so everything that you're likely to need -- including entertainment systems, wireless internet, BBQ, and even Champagne stoppers -- are all on hand. There also are two clothes washers and dryers so there is no need to bring lots of clothes. The location on the beach is to die for. Having small children with us (ages 1, 3, 4, and 9), we tend to use the pool a lot but we're also at the beach most days. The beach is just a few steps from the pool across the sand dune, so you don't have to lug a lot of gear with you when you go. You can go back to the house for lunch and get back onto the beach with little fuss, assuming that you can get the kids (and the adults!) out of the water. The beach itself is very gradual and generally has little wave action so it's perfect for small children. And the water is very clean, the bottom is all sand, and the water temperature in summer months is about 30 degrees Centigrade (~ 85 degrees Fahrenheit). Just brilliant! 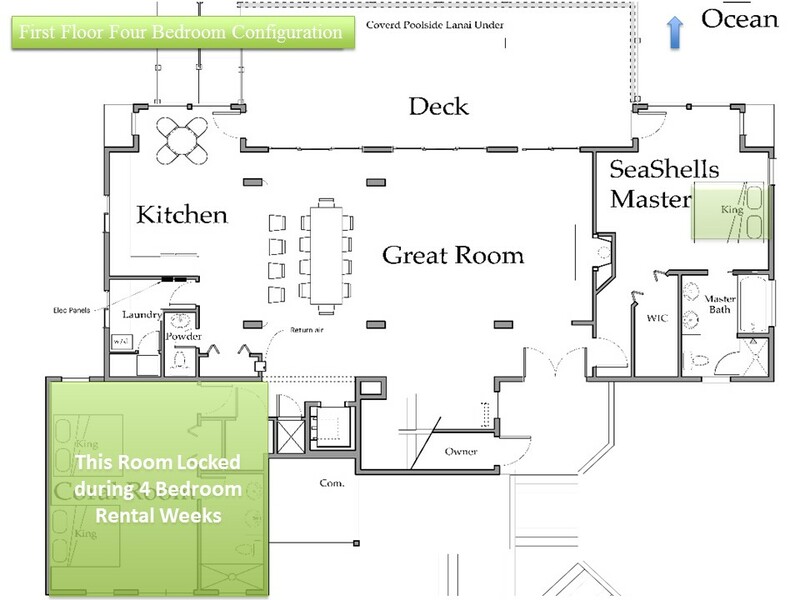 The location of the property in North Forest Beach is very convenient. It is close to food and wine stores, general shopping, and lots of family-friendly restaurants. It is about 15 minutes from HHI airport. We are very thankful that we found Sandpiper during our first year at HHI and intend to go back for as long as the house is available. We've created so many lovely family memories there! Oh my! The house is outstanding. My siblings and their spouses are hard to please, and all have only said wonderful things. My mom has totally enjoyed sitting with all of us talking. I can tell you it is so nice that a home this size has enough rocking chairs so all have a place to sit outside. The view is beautiful and the spa is awesome. Today, we played 18 holes of golf, rested in the spa, and walked on the beach. My goldendoodle, Kagney, is having an awesome time as well. The side fenced yard is great and she has enjoyed running on the beach. She has never slept so well. We have rented homes before on different beaches, but Kathleen, yours is the best. Thank you so much. "A Thanksgiving Week to Remember"
We have a large family and I wanted to find a home on the ocean that all of my family and friends could enjoy, including my mom who is 91. 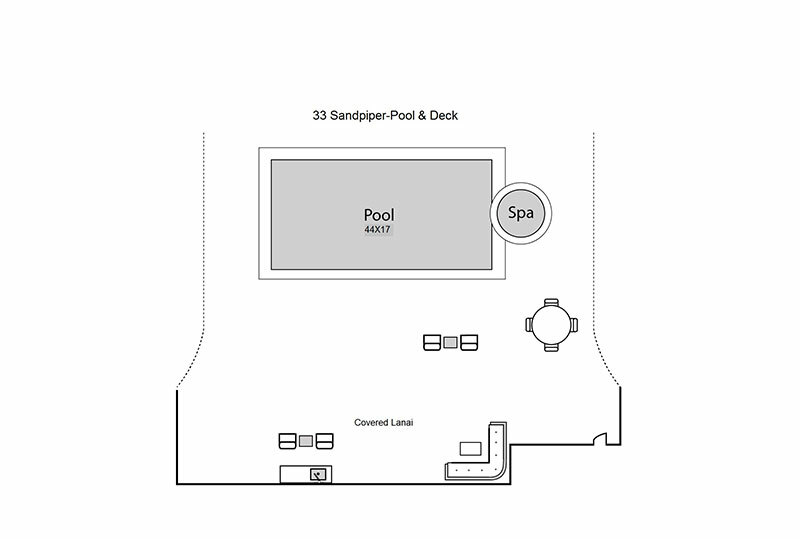 33 Sandpiper was beautiful, from the living space to the bedrooms. 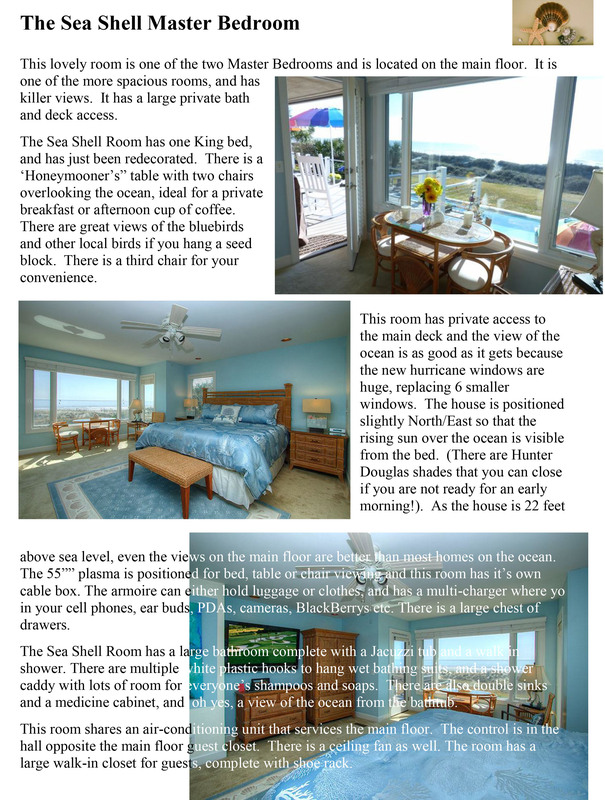 Oh, and lets not forget the wonderful deck overlooking the Ocean and the heated pool. This home also offers a wonderful fenced area for a dog, which my golendoodle enjoyed. Best Vacation home ever! "Perfect Beachfront Home for a Wedding"
"Incredible Home on the Beach"